This picture is one of a series showing mobilised troops in Nottingham. (See NTGM010532- NTGM010535). The date given was September 1913, but very little seems to have been going on with the Sherwood Foresters at that time. The 1st Battalion was in India, and the Chesterfield battalion were at a camp at Clumber. 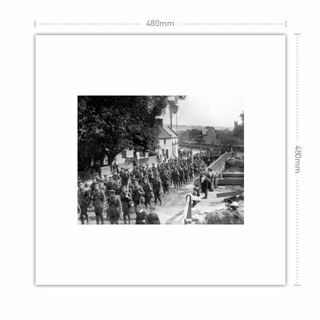 These pictures mostly show troops being watched by large crowds and families, which usually suggests that they are about to go off to war, so a more likely date for the pictures would be September 1914 and the start of World War 1. When War was declared, The Sherwood Foresters only consisted of eight Battalions and a depot at Derby. During the War the Regiment expanded to a maximum of 33 Battalions, of whom 20 served overseas. Altogether some 140,000 men, nearly all from Nottinghamshire and Derbyshire, served in the Regiment. 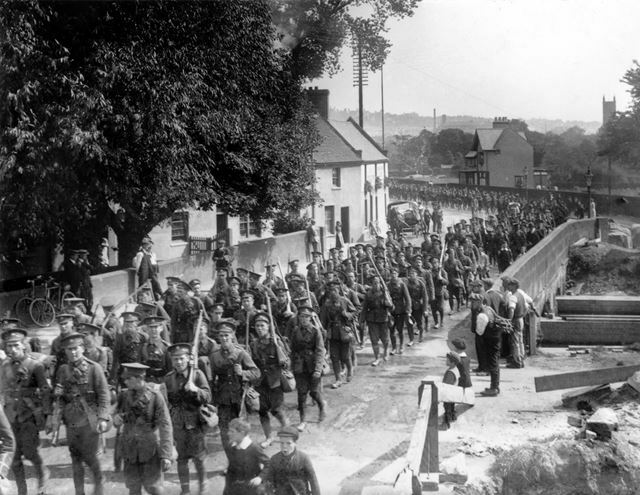 The 2nd Battalion was part of the British Expeditionary Force, which landed in France in September 1914, and went straight into the bitter fighting on the Aisne. On 20th September (the anniversary of the Battle of Alma - a previous Battle Honour of the 95th), the Battalion carried out a counter attack to plug a gap in the British lines. The casualties were almost identical with those at Alma, 17 out of 22 officers and 214 out of 930 other ranks. 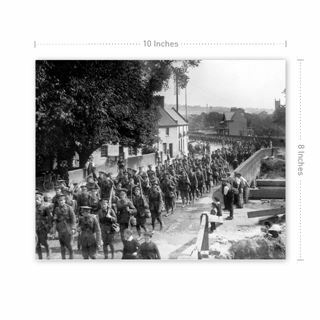 Reinforced, the 2nd Battalion fought another major battle in October at Ennettiere on the way to Ypres, holding a vastly superior German force for 48 hours and losing in the process 16 officers and 710 other ranks. 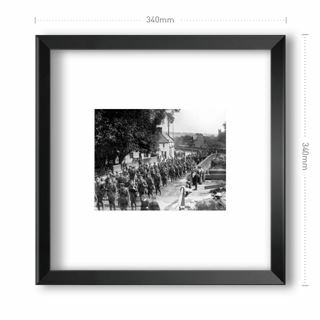 The 1st Battalion was in India at the outbreak of War. It was brought home, and sent to France in November 1914 without any chance of adjusting itself to European conditions and as a result suffered badly in its first four winter months of 'Trench War'. 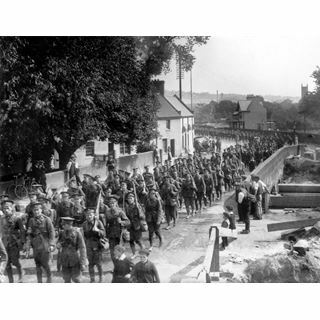 The Battalion took part in two of the major battles in 1915 - Neuve Chapelle and Loos, and suffered severe casualties. Pte. J. Rivers and Cpl. J. Upton were awarded VCs for bravery. Both 1st and 2nd Battalions continued to serve in France until after the Armistice on 11th November 1918, and overall were the most heavily committed of all the battalions of the Regiment. The 3rd and 4th Militia Battalions were embodied at the outbreak of War but remained in the UK as holding and reinforcement units. The Territorial Army was immediately mobilised on the outbreak of War, and the original four Sherwood Foresters Territorial Battalions, the 5th, 6th, 7th (Robin Hoods) and 8th, formed the 139 (Forester) Infantry Brigade in the 46 (North Midland) Division. In September the Territorial Army was doubled and almost overnight the 2/5th, 2/6th, 2/7th (Robin Hoods) and 2/8th Battalions of the Regiment were formed from the original Battalions, and were made up into the 178 (Forester) Infantry Brigade of 59th (North Midland) Division.